I'm usually a bit let down after my guy is defeated in a tournament. However, "La Monf" has put forth such a galliant effort in this tournament that his loss was not very painful on Friday. Although Gael was not able to prevail against world no. 1 Roger Federer, he got the job done just the same. Gael injected some much need hype into the second half of Roland Garros this year and gave us some very unexpected excitement. Federer defeated Gael 6-2, 5-7, 6-3, 7-5. It is definitely worth mentioning that the Frenchman had some ocular issues. 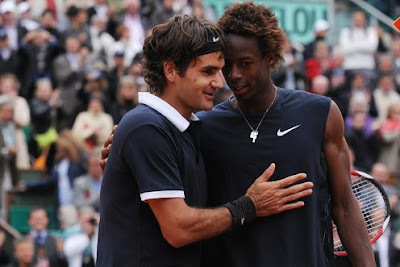 "This morning I already had a pain in my eye and I think I broke my contact lens," said Monfils following his defeat. "I couldn't see well, so I tried to put some eye drops in at the beginning of the match. Then it didn't work, so I asked the doctor to come on the court. That didn't work. "I think part of my contact lens stayed, remained in my eye. I managed to take the other part out, but there was one part left." "I am not trying to find any excuses, but it didn't help," said the 59th-ranked Monfils. "Each time I was trying to serve it was annoying me." It's all good Gael, we're just glad to see you in this very positive finish. Keep it up!